Every once in a while I get in a little funk. Not the kind of funk that makes me want to lay in bed consuming a bag of Cheetos and a bottle of Moscato while watching 10 episodes of Storage Wars, but a funk nonetheless. You’re judging me right now aren’t you? I’ve never really done those things – but almost. I’m talking more of a baking funk, when nothing sounds good and my list of must make items is less than inspiring. I’ve learned throughout my four years – yes, it’s been four whole years as of yesterday – of blogging that sometimes ya just need a break. And it’s far better to chill out and watch those episodes of Storage Wars as opposed to forcing creativity. [pinit] I often get asked where my inspiration comes from and honestly it comes from everywhere – books, bakeries, blogs, hey, that’s a lot of b words. However, the bulk of my inspiration comes from the market. I love strolling through the aisles and checking out the fruit, candy, and baked goods – and chucking things into my cart if they strike my fancy. That’s exactly how I got out of my latest funk with these Milky Way Brownie Bites. Someone left a bag of miniature Milky Way candy bars on top of a box of store-made brownie bites. And just like that – BOOM – funk over. And to the lazy customer that randomly tossed their bag o’ candy into the bakery section – my creativity thanks you. 1. Preheat oven to 350 degrees. Lightly spray the wells of a nonstick miniature muffin tin with nonstick cooking spray such as Pam. 4. Using a small cookie scoop (about 2 teaspoons), scoop the brownie batter into the prepared miniature muffin tin wells. Place a miniature Milky Way into the center of each well and press it lightly into the batter. Do not worry about covering the Milky Way with batter. Bake brownies in preheated oven for 9-10 minutes, the edges will look set. Do not over bake. 6. To make the caramel sauce, place the caramels and heavy cream in a microwave-safe bowl. Microwave on 50% power in 30-second increments until the caramels begin to melt; stir frequently. Continue warming and stirring the caramels until you have a smooth, creamy mixture. 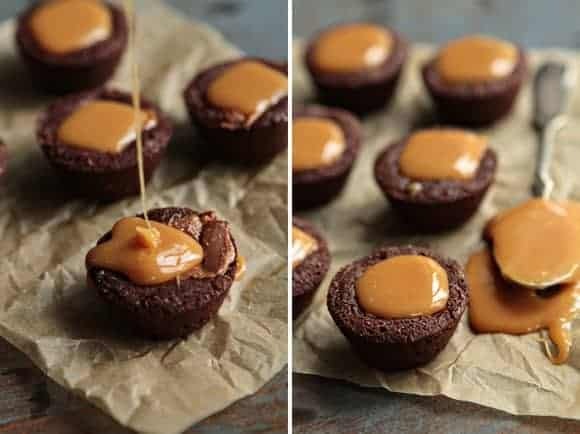 Drizzle caramel onto the center of each brownie brownie bite. What cute little treats! 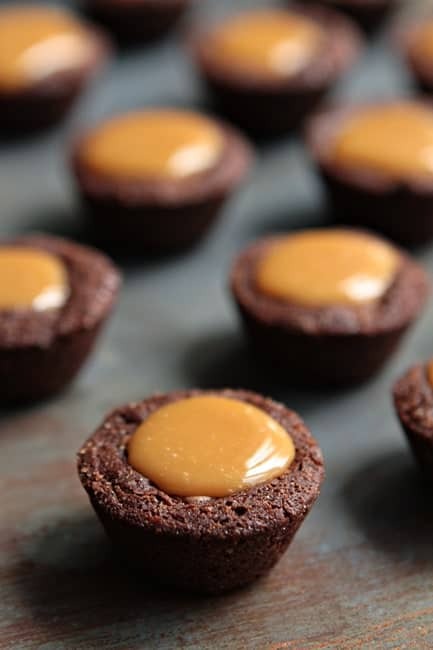 I love how the simple addition of a caramel sauce turns a normal brownie treat into something new! Very cute. Definitely a must try. What an excellent way to get over a funk! I love milky bars, love brownies, love caramel. I’ve made brownies with Milky Ways inside, but never bite sized! Yay for getting out of a funk! I’m so happy for that lazy customer in this case :D lol, What a killer brownie … yuummm and that caramel on top is killing me. DEELICIOUS. Cute little treats… Pure bliss… Must try. Bookmarking them. I’m quite certain this little treat would put me in a sugar coma. Because I would sit down with a plate of them in front of Storage Wars! MAN, these look good!! Brownie bites AND Milky Way minis? Two of my favorite indulgences. I MUST make these tonight! Yep, these would make pretty much any day better. Love ’em! Gosh, it’s been so long since I had Milky Way… Too long! 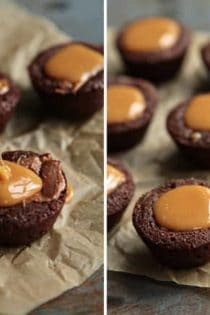 Love your idea to combine them with brownie bites! Yum! Great idea! Need to give these a try! Thank U VERY MUCH for every minute of pleasure! Milky Way is my favorite candy bar. I’ve gotta try these! I’m sure these will go on the list of things my boyfriend tells me not to make any more because he eats the entire batch in one day (ie caramel brownies) and can’t be trusted with them at home! These are seriously the cutest little things…I love. And I love where inspiration comes from too, you never know when it’s going to strike. I’m so glad you got out of your funk. These look heavenly!!! How unique! And its bite-sizedness is so incredibly dangerous since I could just pop a million of them at once! You are freakin AWESOME! I love this idea and I will definitely try this sometime! I sometimes get the urge to bake brownies or chocolate cake – FOR MYSELF! Jip – you got me – i am an addict. Trying not to get tooo funky other wise I would never fit into my jeans, I keep my funkiness for the weekend when I can officially cheat! This would be on top of my cheat list!!! I can totally relate! I definitely go through creative blogging/baking/cooking slumps! These look like the perfect treat to get out of a slump! I love brownies to begin with. But with Milky Way stuffing and caramel on top, wow! Wow! Yum. Just pure yum! I love trying new things and messing around with ingredients. I can’t wait to try them!! Good job. What size pans do you use for these? Sybil, these are standard mini muffin pans. This is so easy to make, and it looks so delicious! I love Milkey Ways, and I love brownies. 2 in 1, how amazing is that? Your recipes are the best! Definitely going to try this one out, getting hungry allready!